Location: Montlucon, in the Allier departement of France (Auvergne Region). Ownership / Access: Houses a museum dedicated to popular music and instruments. Notes: Château des ducs de Bourbon à Montluçon is a castle built by the Dukes of Bourbon, which dominates the town of Montlucon. It is the subject of a registration as a historic monument since May 15, 1926. This belief was fostered by the presence, in different houses in the street Locksmiths, vaulted corridors, quite long, extending even -delà houses in the direction of the castle. These corridors are actually vast cellars, all more or less reduced in length by the construction of modern walls, and some of which were common to two buildings located on both sides of the street. It is impossible to see anything. More certain, however, is the existence of secret passages inside the castle. Passages secrets Louis XI borrow during his stay in Montlucon in 1465. The first of these passages was in the turret of the west facade, the second was in the southern part of the square tower, before the walls come clog and the third was in the northern part of the enclosure of the castle. Since 1959, the castle housed a museum dedicated to popular music. 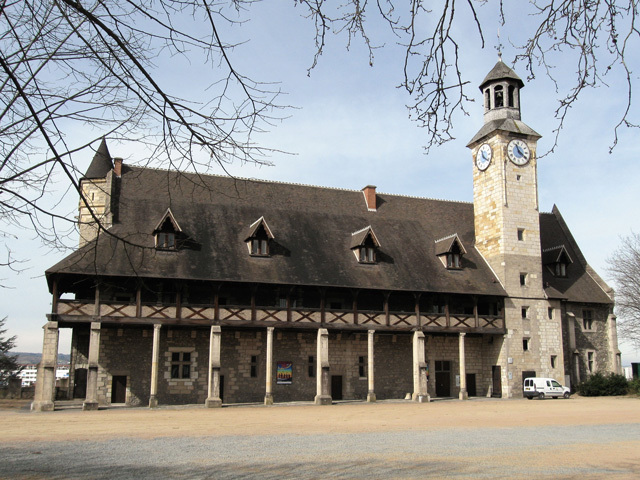 Since 2013, the castle now serves as a reserve to the new museum of the city of Montlucon, the MuPop.